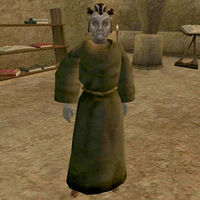 Telis Salvani is a Dunmer healer who works at the Balmora Temple where he sells ingredients, potions, and spells to all who need them. He is a restocking vendor of the following ingredients: Ash Salts, Bittergreen Petals, Chokeweed, Comberry, Green Lichen, Netch Leather, and Rat Meat. He also keeps a constant supply of some basic restorative potions. * This spell is actually useless, since you can't cast spells while paralyzed. However, you can use it to learn this effect in order to apply it to custom spells or enchantments.